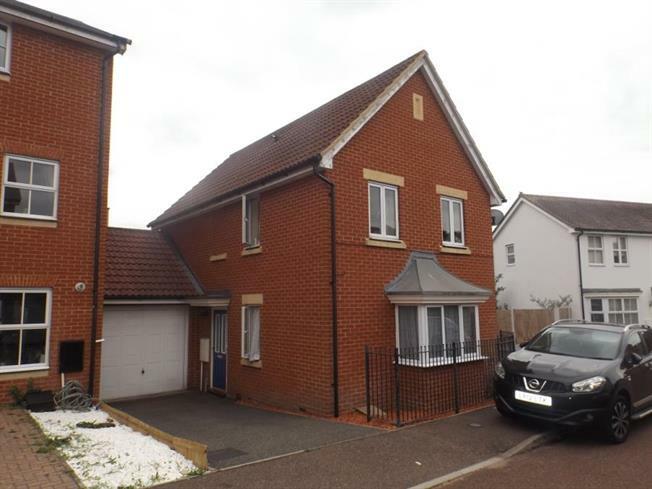 3 Bedroom House For Sale in Colchester for Offers Over £280,000. Offered for sale with no onward chain, this three bedroom family home is situated just over half a mile from The Gilberd School. It benefits from a garage with off road parking, two reception rooms, a separate kitchen and downstairs cloakroom. The upstairs accommodation comprises of three bedrooms, one with an en-suite and a family bathroom. There is an enclosed garden to the rear. Double glazed bay window to the front, double glazed window to the side. Wall mounted radiator. Fireplace. Double glazed patio door to the side, wall mounted radiator. Double glazed window to the side aspect, selection of wall and base mounted units with a roll top work surface, sink and drainer. Integrated oven and hobs, space for a washing machine and a fridge/freezer. Obscured double glazed window to the rear. Double enclosed shower, low level WC, sink in vanity unit, wall mounted radiator. Double glazed windows to the front and side aspects, wall mounted radiator. Built in airing cupboard and storage cupboard. Bath with shower over, low level WC, sink in vanity unit, wall mounted radiator. Fence enclosed boundaries, patio area and decked area with the remainder being laid to lawn. Door leading to garage. Parking to the front.